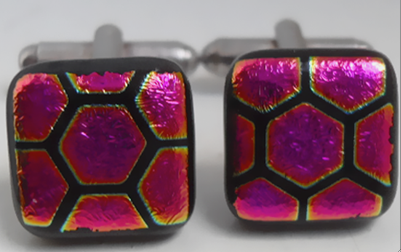 These unusual square shaped cufflinks are made of a Black/Gold honeycomb pattern on Magenta Dichroic glass. The Gold in the design shines in the light. The glass pieces measure 1.4cm x 1.4cm and are made of two layers of glass a layer of Black and a layer Magenta with a Black honeycomb design Dichroic glass. They have good quality plated silver fittings come in a Black card cufflink gift box.